You can rely on our team of experts to provide you with superior service. 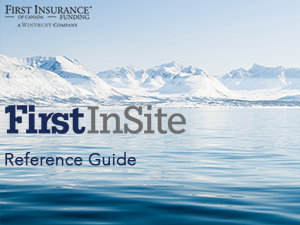 We are pleased to equip you with comprehensive online guides to make your use of First InSite seamless. This guide conveniently walks you through how to easily create a quote via the First InSite web site. This manual guides you through the loan submission process, after your client has chosen easy monthly payments. Access this manual to guide you through the Renewal Process. First InSite enables you to easily manage your client accounts. Access this guide to view all of the features you are able to manage in each account. A quick reference guide which visually summarizes the processes for Creating Quotes, Submitting Loans, Processing Renewals, and Managing Accounts. You can print or view online this user-friendly reference guide. clientservices@firstinsurancefunding.ca and 1 888 232 2238.